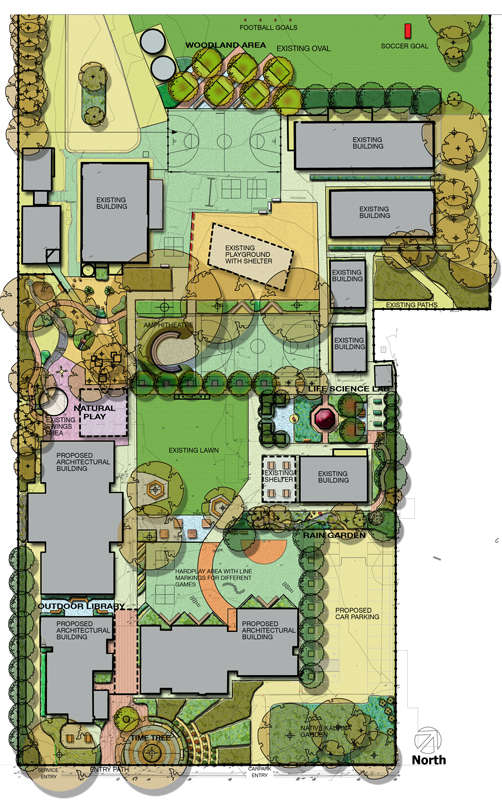 As part of the major building development at Evanston Primary, designwell was commissioned to prepare a Landscape Master plan to accommodate future growth. The design takes into consideration the different age groups of children and provide accordingly for play-based learning in close relation to nature. The entry landscape makes a bold statement by having a “Time Tree” that resonates local history. Areas are designed for flexible imaginative and nature play. Outdoor learning that compliments the curriculum is supported by teaching areas such as the “Rain Garden”, “Vegetable Garden” and “Native Kaurna Garden”.